NuCurrent, a leading wireless power system and magnetics solution provider, announces the Illinois Technology Association (ITA) has named NuCurrent a finalist for the 2017 ITA CityLIGHTS Industry Disrupter Award. Now in its 18th year, the ITA CityLIGHTS is the premier annual event that elevates and honors achievements from the local tech community. Winners for each of the eight award categories will be announced at a gala event on September 14 at Morgan Manufacturing in Chicago. The Industry Disrupter Award is presented to the company that has developed or introduced an ingenious, non-traditional, and innovative product or service that has significantly disrupted its industry. All award finalists are selected by a panel of accomplished judges representing the Who’s Who in Illinois technology. The public can contribute to the selection of this year’s winners by voting from August 7-18 at http://www.itacitylights.com/voting. Winners will be determined by a composite score of the judges' scores and voting by the public in all categories except the Industry Champion, which is determined solely by the ITA Board of Directors. NuCurrent was recently named a 2017 FLEXI Product Innovation Award winner and 2016 IoT Breakthrough Awards’ M2M Embedded Hardware Company of the Year. The company was also named a Chicago Inno 2016 50 on Fire Winner, which honor the year’s most groundbreaking individuals and organizations across industries in the Chicago area, and a winner of the 2015 Chicago Innovation Up-and-Comer Awards. NuCurrent was also named No. 1 on the 2015 Crain’s Chicago Business Eureka Index with the highest per-capita patent output of any company in Illinois. The company was also listed in the top 10 percent overall in patent quality score, which considers the uniqueness of the invention covered by a patent and other important factors. 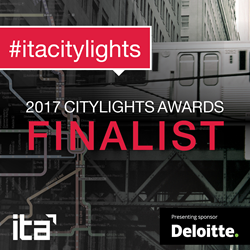 To view the 2017 ITA CityLIGHTS list of finalists or cast your vote for the award category winners, visit http://www.itacitylights.com between August 7-18. To learn more about NuCurrent, please contact info(at)nucurrent.com or visit http://nucurrent.com. NuCurrent is a leading developer of high-efficiency wireless power solutions including magnetics and full-system integration. Whether customers want proprietary frequencies and solutions or compliance across the Wireless Power Consortium (Qi) or AirFuel AllianceTM, NuCurrent works closely with electronic device OEMs and integrators to determine the best implementation of wireless power for their product and deliver that solution through custom-design, rapid-prototype, advanced simulation, and superior performance. NuCurrent’s patented technology, proprietary tools and design techniques mitigate typical high frequency effects, offering higher efficiency, smaller sizes, higher durability, and lower total cost for wireless power system implementation. Based in Chicago, NuCurrent has been defining the leading edge of wireless power design since 2009 and has over 50 patents granted or pending worldwide. For more information, visit http://nucurrent.com and follow us on Twitter at @NuCurrentTweets. The Illinois Technology Association (ITA) scales Illinois tech companies. With innovative resources that allow members to collaborate with each other, build their talent networks and elevate their local and national presence, ITA is the region's strongest advocate for fostering innovation and growth. Founded in 2005 and supporting 500-plus growth-stage tech companies, ITA has a rich history of driving business forward. For more information, visit illinoistech.org, follow @ITAbuzz on Twitter or find us on LinkedIn.